Ann Gould. But the Flying Tiger Lines needed another flight attendant to accompany the 68 servicemen and their families to Frankfort, Germany. The appropriate officials of her department called Miss Gould’s mother, Mrs. Edward Ziegler, at 4:30 a.m. that Sunday morning. Miss Gould, 22, was one of the stewardesses aboard the Super Constellation (Flying Tiger 923) that ditched in the cold north Atlantic that Sunday night. It was a lucky thing for those 68 servicemen and their families. Maybe it was not so lucky for Carol Ann. 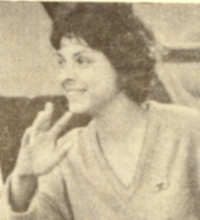 She started working for Flying Tigers in July of that year, having worked for five months for Frontier Air Lines in Phoenix, Arizona, and as a reservation clerk for Delta Airlines in New York. She was the only flight attendant who survived. Story that ran in local news. Pilot John Murray had 24 years of flying experience, and many hours in the Super Constellation, but — the stewardess did not point out – he’d never before ditched a plane. At the end, she did not fasten her safety belt until the last possible moment. She and the other stewardess moved from passenger to passenger whispering, “Just sit tight,” and made sure that safety belts were secure and that passengers were in the proper crash-landing position. She did not know their altitude, or when the plane would hit the sea, but she went to the end of the aisle in the stern section and returned to her station only when she was certain her passengers had followed her orders to the letter. Then she finally took a seat and strapped herself in, to wait – like the others – for the end. Waiting . . . waiting . . . and waiting for impact. After impact, she stayed inside the aircraft to make sure passengers were finding their way out. Finally she was “pushed out” by a soldier who could see there was no more hope. Outside, in the raging seas, she found her way to the lone, single life raft and was pulled in. But that wasn’t the end for her. She spoke to as many as possible around her. She lead the group in songs. She spread all of the cheer she could muster and for many, it paid off. Once aboard the rescue ship Celerina, she helped where ever she could and stayed with the remaining passengers until their arrival in Antwerp, Belgium. She gave up flying once safely home. Any wonder??? This entry was posted in flight crew and tagged Carol Ann, Carol Ann Gould, Carol Ann Gould Hansen, Carol Ann Hansen, Flight 923, flight attendant, Flying Tiger Line. Bookmark the permalink. 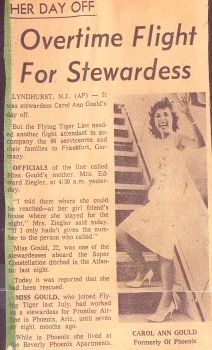 I invited Carol to be the keynote speaker at one of the Flying Tiger Line Pilots Association’s reunions. She brought many of the newspaper clippings, pictures and articles written about the ditching with her to share with us. Because many of our retired crew knew the crew Carol had ditched with, the entire event was bitter-sweet. Carol stood there and told us one of the most horrific stories any flight crew could imagine and she did it with a clear voice and a dry eye – unlike many of us in the audience. Her’s is a powerful story of life, death and determination. Carol is one of the dearest people I know, she has had many tests in her life and she is still kind, loving and wonderful. This is a terrific website and I am very glad you have kept this heroic story from disappearing from aviation history. Hello to all of my FLYING TIGER LINE FLIGHT ATTENDANTS! This is Cherrie Hildreth and I have been trying to reconnect with many of what I called My Flight attendant Family. There were not many of us, therefore a bond internally that will live on with and in me. If someone would please contact me 832 721 6999 (Houston), I t would make 2013 even more of a promise fullfield year. I started working the front desk HDQ., for Mr. Prescott and then on to Flight Attendant training flyiny into countries I never imagined I would see. What memories….